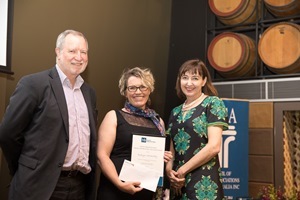 Our congratulations go to Robyn Carmody, who is the recipient of the inaugural Teachers Registration Board Induction & Mentoring – Early Careers Award. Robyn was presented with the award by Susan Close, Minister for Education & Child Development at the Council of Education Associations of South Australia’s 2016 World Teacher Day awards ceremony. Robyn, who works at Blackfriars Priory School, was nominated by Visual Arts Educators Association President Ruth Flaherty for her outstanding commitment to supporting and assisting early career teachers. Her achievements include initiating and running a primary school teacher’s support network for visual arts including a Facebook page for primary art teachers, as well as hosting workshops that assist early career and primary school teachers to develop effective classroom practice. It is vital that more experienced educators support those at the beginning of their careers and we look forward to hearing more inspiring stories each year. Nominations for the annual award open each September. Responding to Abuse & Neglect – Education & Care (RAN) full day course, $84.59. Education Development Centre, Hindmarsh, 9:00am – 4:00pm; Tuesday 13 December & Thursday 15 December. More information here. Natural Maths is holding two workshops in January. An introduction to natural maths, Monday 16 January and Numeracy in the early years, Thursday 19 January. Both workshops 9:00am – 3:00pm at the Education Development Centre, Hindmarsh, $135 per participant. More information here. LEARN Autism for School is being held on Tuesday 10 January 2017, 9:30m-4:30pm, 310A Glen Osmond Road, Fullarton. More information here. The SA Science Teachers Association presents the 2017 Psychology Summer Conference. This 1 day conference allows science teachers to develop teaching methods and resources within the Psychology stream. Friday 20 January, 9.00am – 4.00pm at the Education Development Centre, Hindmarsh. Find out more here. The Stephanie Alexander Kitchen Garden Foundation is holding a one-day workshop for all educators that incorporates hands-on skills-based instruction in the kitchen and garden learning spaces. You DO NOT need to be a Kitchen Garden Program School or Kitchen Garden Classroom member to attend. Thursday 23 February, 9.00am-3.30pm at St Michael’s College Primary, Beverley. Find out more here. Home Economics Institute of Australia is holding Home Economics without borders their 2017 national conference at Rydges Melbourne Wednesday 11 – Friday 13 January. More information here. The Australian Council for Health, Physical Education and Recreation is holding their 30th International Conference, Monday 16 January – Wednesday 18 January at the University of Canberra. More information here. The Australian Library and Information Association is holding their Information Online Conference, Monday 13 February – Friday 17 February at the Hilton Hotel in Sydney. More information here. At the end of a change-filled and productive year, the Board would like to thank everyone for their support and contributions to our activities in 2016. We hope you have an enjoyable and safe holiday season and we look forward to working with you in 2017.